Description: This special gift edition is beautifully packaged in a smaller trim size with a one-piece fine cloth case, a gold-stamped cover, and a whimsical interior design, featuring a frontispiece illustration and line chapter opener ornamentation by noted artist Charles Vess. 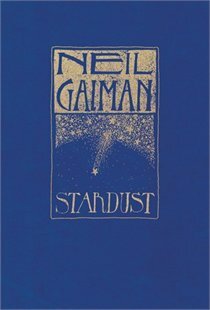 It also contains an introductory note by Neil Gaiman. Tristran Thorn will do anything to win the cold heart of beautiful Victoria Forester?even fetch her the star they watch fall from the night sky. But to do so, he must enter the unexplored lands on the other side of the ancient wall that gives their tiny village its name. Beyond that stone barrier, Tristran learns, lies Faerie . . . and the most exhilarating adventure of the young man''s life. "She made a face to indicate just how old five-and-forty is, when you happen to be seventeen." "They certainly were fine new clothes. While clothes do not, as the saying would sometimes have it, make the man, and fine feathers do not make fine birds, sometimes they can add a certain spice to a recipe. And Tristan Thorn in crimson and canary was not the same man that Tristan Thorn in his overcoat and Sunday suit had been. There was a swagger in his steps, a jauntiness to his movements, that had not been there before." I love The Princess Bride! I'm guilty of not having read this author either, but now I will pick up this book because your review has made it so tempting. I bought the Graveyard book and just have to finish 3 review books before I can read it. I love his style of reading. Will def take you up on the offer of the movie. When are you coming to visit usÉ Any way we can get you back -- hey I am willing to do anything to get you back!! !